Find your issue below and follow the steps. Reboot the phone by holding 1 – 3 – 0 . If the reboot does resolve the issue, press and hold 1 – 4 – 7 until the phone details appear. Record the first three items (IP Address, MAC and VLAN ID) and Contact the ITS Service Center. Your phone may or may not require a power adapter. It depends whether the network port is capable of providing power to the phone. If you moved locations or plugged your phone into a different network, you may need a power adapter. Make sure the cables are connected correctly. Click here for a diagram. Make sure the power adapter is plugged into the electrical outlet. If you have just moved your phone, you may need a power adapter. Contact the ITS Service Center to open a trouble ticket. 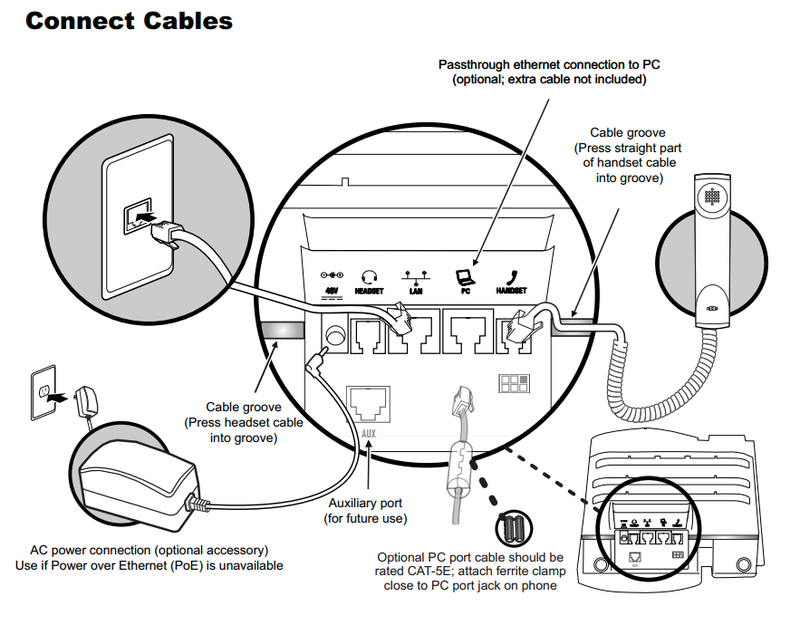 A network technician will test the network port and verify cables. Check to make sure the network cables click into the ports on the phone. Inspect the network ports on the phone for dirt, bent pins, or corrosion. This would cause a loose connection and result in sporadic disconnects. If you suspect a problem Contact the ITS Service Center.